Just as we are experiencing the transformation to winter, the lakes around us are facing their own seasonal changes. During spring and fall, the water column experiences a process called turn­over, the mixing of water from different depths, and a redistribu­tion of oxygen and nutrients. This process supplies necessary sources of oxygen and nutrients for aquatic life to survive the winter. First to understand the turnover process, it’s important to recognize the unique characteristics of water. They are ultimately what make life in frozen lakes possible! When you look at ice in a glass of water, do you notice how it floats? Water is different than most substances in that it is less dense as a solid than a liquid, allowing ice to float above the water rather than sink. In fact, water is most dense at 4° C (39° F)— that’s frigid water, but still 4 degrees above freezing. In the summer, when you dip your toes deep into the lake, you’ll notice at a certain depth the water starts to feel cooler. That’s because summer lake water is layered with the warmest water on top, and the cooler, denser water at the bottom (Fig.1). In fall, the turnover process begins and these layers break down. 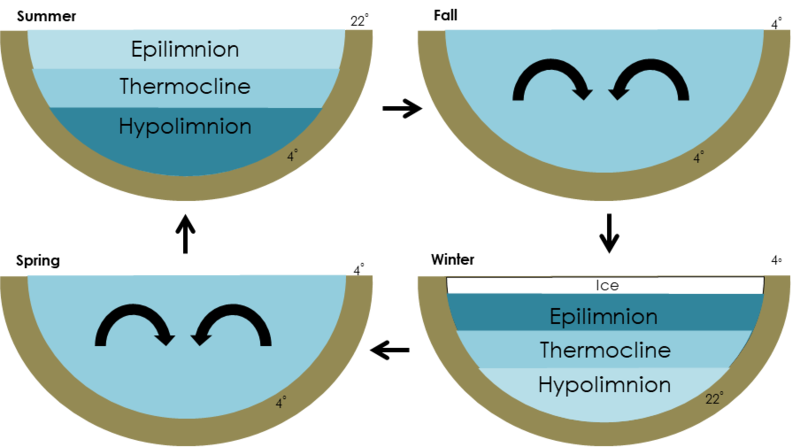 The warmer water in the upper layer cools and becomes easily mixed with the lower layers, often assisted by winds and storms (Fig. 2). This mixing goes on until the temperature drops below 4° C (39° F)—, that critical number when water is densest. 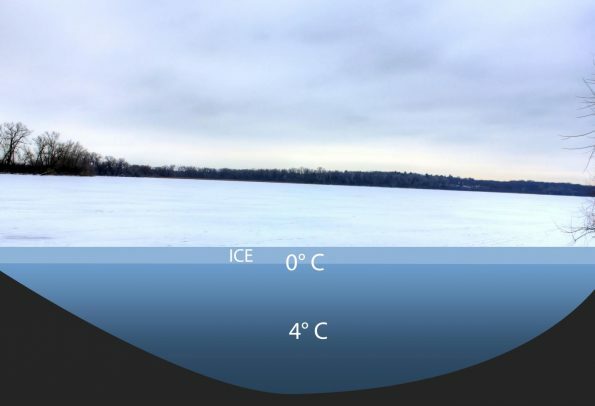 As ice-over approaches and temperatures continue to cool, the lake’s water column becomes stratified again, this time with the warmest water on the bottom and coldest water on the top. Eventually, the upper­most water will freeze, forming an insulating layer of ice that actually helps the water underneath retain its relative warmth throughout the cold season (Fig. 3). Life under the ice adapts to the quiet, cold, and often light-less winter. Fish will mostly stay to the bottom of the lake where the water is warmest. Frogs, turtles, and tiny invertebrate animals called zooplankton also migrate to the bottom, where they spend time in and out of the mud. While this might sound unbearable to the average human, these aquatic ani­mals are all cold-blooded, meaning their internal temperatures adjust to match the temperature of their environment. In cold water, their metabolism slows down, they don’t need as much energy, they move more slowly, and they require less oxygen in winter. It does not make life any easier for them though. Despite things slowing down, interactions and competition between organisms does not stop. Predacious fish, for example, still need to eat. The top challenge aquatic commu­nities face in winter is the threat of running out of oxygen before the ice opens up in spring. Ice seals off water from atmospheric sources of oxygen. Ice also blocks sunlight, restricting plants from producing oxygen on their own through photosynthesis. Plants will grow where they can, at the underside of the ice, where the ice is least opaque. But plant growth is drastically more limited in winter than in other times of the year. Most oxygen available to fish, turtles, zooplankton, and other lifeforms was brought into the system during fall turnover. The oxygen-replenishing act of mixing (and the unique density properties of water!) is an important process that sustains lake life year round. This winter when you skate or walk on the ice, take a moment to appreciate the beauty of turnover and all the life underneath your feet, waiting to flourish as ice out nears. When ice does melt at winter’s end, the spring storms will aid to mix the water from top to bottom. At this time photo­synthesis increases, producing an abundance of dissolved oxygen once again for aquatic life to survive another season of dashing under your canoe or serenading you while you watch the Wingra sunsets.